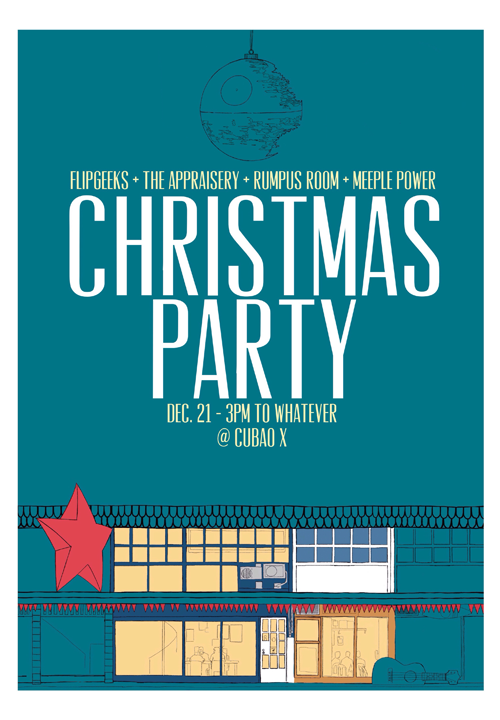 FlipGeeks, the number one portal for everything geek culture, The Appraisery and Rumpus Room is holding a "Geek Xmas Party" at Cubao Expo on December 21, 2014 (Sunday) from 3pm to 12am. There will be various activities including raffles, board games and video games for the geek community, bloggers, and media people to enjoy. Registration to join the activities will start at 3pm and those registered will be entitled to one ticket for the raffle. Together with FlipGeeks, Owners Victor Prieto (The Appraisery), and Kiko Aquino (Rumpus Room) joined forces to bring us the "Geek Xmas Party" to help develop the local geek community by instilling a deeper sense of community between geeks – helping bridge the gap and enhancing the geek experience. This is made possible by the various members of the geek community, bloggers and media people bringing together various audiences of geek culture from comic book fans, moviegoers, video game fans, etc. Our partners in The Appraisery and Rumpus Room are also hosting activities for everyone. Get ready to be introduced to board games through the The Appraisery and enjoy it with your friends. If the virtual world is more to your liking, let Rumpus Room show you how it's done. Registration starts at 2pm, so be sure to be there early! Check out FlipGeeks.com and subscribe on Facebook (www.facebook.com/flipgeeks) for more details on the party and updates on the current happenings with geek culture.